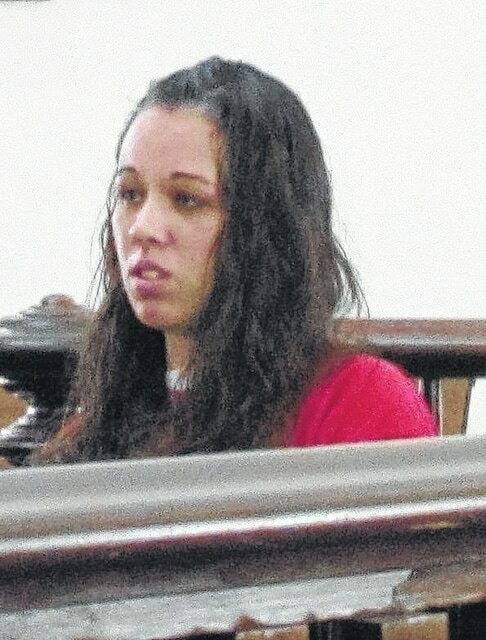 Dakota Miller is pictured in Highland County Common Pleas Court on Tuesday. A Greenfield woman was ordered to serve the remainder of a previous prison term on Tuesday after admitting to probation violations. Dakota Nicole Miller, 24, admitted to violations that included using illegal drugs, failing to report, and failing to complete STAR aftercare. She was sentenced to 24 months in prison in October 2013 after pleading guilty to third-degree felony illegal assembly or possession of chemicals for the manufacture of drugs. She was granted judicial release to the STAR program about a year ago. As previously reported by The Times-Gazette, Miller was charged with the same offense in early June following the discovery of one-pot meth labs where she was living. The discovery came after an Adult Parole Authority officer and law enforcement came to the residence seeking Miller on an arrest warrant. Jacob Cox, 19, who shared the same Greenfield address with Miller, was also charged with third-degree felony illegal assembly following the one-pot meth labs being discovered. He pled guilty to the charge last week and is scheduled to be sentenced in August. In another hearing, James R. Sammons Jr., 34, Hillsboro, pled guilty by a bill of information, which waives the right to be prosecuted by indictment, to fourth-degree felony receiving stolen property. As previously reported, Sammons was initially charged with a third-degree felony for the theft of a firearm from a residence while he was working with the Highland County Community Action Organization, Inc. According to Sammons on Tuesday, his employment with Community Action ended on June 6. Sammons has no previous record and on Tuesday was admitted into the prosecutor’s diversion program. If Sammons successfully completes the program, the felony will be dismissed.